Yasser Arafat’s loud question, “Are you against the resolutions of the United Nations?”, echoed through the small and crowded room when I asked him what kind of independent State he sought for the Palestinians? In a constantly changing world, with new concepts of borders and sovereignty, what is the definition of an independent Palestinian State? How is the PLO leader going to link the West Bank and the Gaza Strip in the future? With extraordinary aplomb, Arafat manages to set the pace of conversation as it suits him. He is an actor, familiar with the stage on which he makes his case. He only needs to captivate the audience. His English often misleads him and occasionally he has to resort to his assistants in order to fin a better term corresponding to the Arabic equivalent. Being a master in the art of manipulative – a skill which has enabled him over the years to keep together the various and even the belligerent factions of the PLO – Arafat always twists the situation to suit himself and did not give a clear reply to our questions. The reply to my questions was perhaps the longest part of this meeting with the correspondents, to which Arafat agreed with a certain goodwill, as his companions acknowledged, because the event was an assignment sponsored by the United Nations. Now that he is back on the stage, having being forced to cross the desert during the Gulf crisis, which he calls “the Third World War”, Arafat can indulge in the luxury of selecting his listeners again. The non-stop pace of his life, travelling through the world by night and day, reflected in his appearance: the face is older, the body is leaner and, in the course of our conversation, he had even to take a pill to alleviate his pains, probably the result of nervous tension. He received the journalists on the same day as the Jordanian-Palestinian and Israeli delegations were discussing in Madrid. It was a day of great emotion. When an editor of the London The Guardian inquired about his reaction to Yitzhak Shamir’s speech, Arafat described the Israeli prime minister [who went Madrid, under pressure from the American secretary of State James Baker – the US threatened to freeze financial aid -, but refused to open a dialogue with the PLO] as prisoner of his own antiquated ideas and clichés. But during the two-hour interview with the journalists, Arafat was also unable to refurbish his statements. The Palestinian leader also repeated old clichés although he was obviously aware of the dangers that could arise for the Middle East unless peace was achieved. 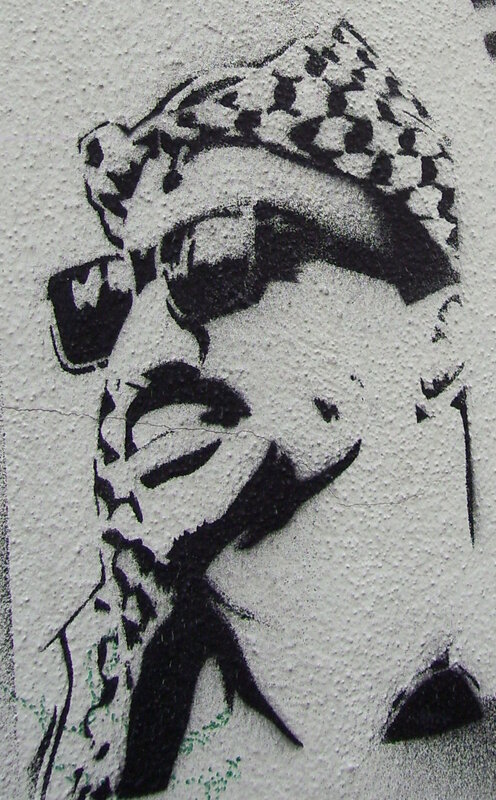 *[“In October 2004, Arafat was taken to France and admitted to the Percy military hospital in Clamart, a suburb of Paris. After a deepening coma, he was pronounced dead, on 11 November at the age of 75, of what his doctors called a massive hemorrhagic cerebrovascular stroke. On November 11, 2004, a French Army Honor Guard held a brief ceremony for Arafat, with his coffin draped in a Palestinian flag. A military band played the French and Palestinian national anthems, and a Chopin funeral march. Then President Jacques Chirac stood alone beside Arafat’s coffin for about ten minutes in a last show of respect for “a man of courage. The next day, Arafat’s body was flown to Cairo, for a brief military funeral there, attended by several heads of states, prime ministers and foreign ministers. Israel refused Arafat’s wish to be buried near the Al-Aqsa Mosque or anywhere in Jerusalem, citing security concerns – above all because of fears that his burial would strengthen Palestinian claims to East Jerusalem. Following the Cairo procession, Arafat was “temporarily” buried within the Mukataa in Ramallah; tens of thousands of Palestinians attended the ceremony. The PLO leader was buried in a stone, rather than wooden, coffin. Palestinian spokesman Saeb Erekat said that Arafat would be reburied in East Jerusalem following the establishment of a Palestinian state. After Sheikh Taissir Tamimi discovered that Arafat was buried improperly and in a coffin—which is not in accordance with Islamic law – Arafat was reburied on the morning of 13 November.